Over 30 burgers from our local Newport restaurants participate in this yearly "best burger" tradition. The contest will take place Friday, February 15th through Sunday, February 24, 2019 at participating restaurants throughout Newport and Bristol counties. 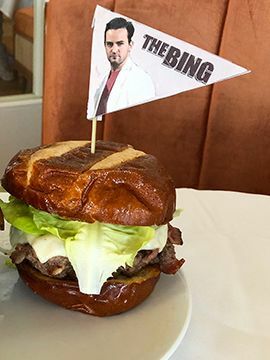 The Chanler has officially submitted a burger called "The Chanler Bing Burger". Our burger starts with three slices of thick cut bacon which is diced then mashed into premium ground beef before being perfectly seared on a pretzel bread bun. It's topped with Monterey Jack cheese, house-made BBQ sauce, onion and lettuce.